Students as collaborators work on “The Nations Tree” with lead artist Liliana Matasa, center, at Lutheran Social Services of Utah are Amanada, Maria, Wata and Akbar. 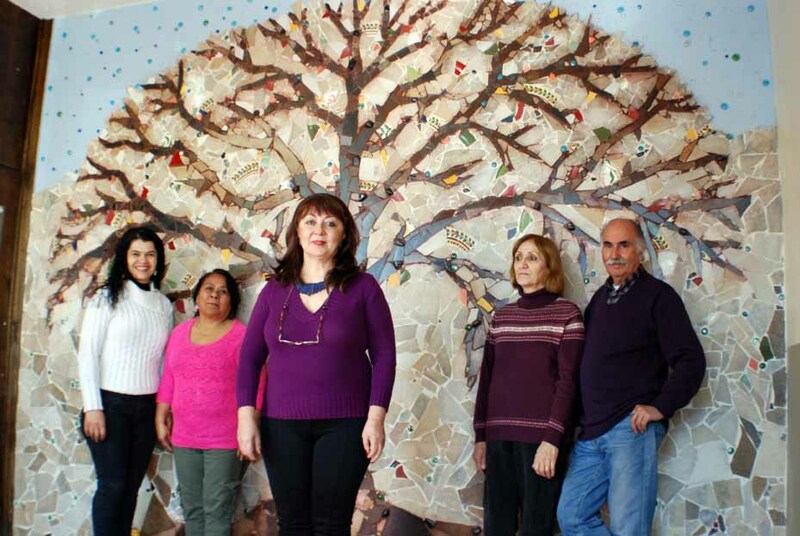 THE NATIONS TREE, Utah — When Liliana Matasa showed up one day last fall wanting to share her time and talents with a neighbor close to her artist’s studio, that neighbor being Lutheran Social Services of Utah, she was welcomed with opened arms. She was given a tour of the facilities. After tossing around ideas with Jose Bonilla and Dr. Leslie Whited, Matasa was allowed creative license to imagine a work of art for this gathering place in Salt Lake City. Matasa also volunteered to share her enormous artistic gifts and profound knowledge in the fine arts as teacher in the classroom to students who are immigrant-newcomers to Utah, if not America. Some of the recent arrivals served by Lutheran Social Services of Utah fled Afghanistan, Bhutan, Bosnia, Burma, Burundi, Congo, Croatia, Eritrea, Iran, Iraq, Lebanon, Liberia, Myamar, Rwanda, Serbia, Sudan, Somalia, Thailand and Sierra Leone. LSSU, which ministers to “All of God’s People,” is among myriad of examples of welcoming newcomers, humanity in action as it were, to the state of Utah. Also, LSSU is no stranger to incubating and making known the creative works of its congregation of refugee-clients. Jose, associate director of Community and Congregational Relations for LSSU, has acquired a knack for pitching story ideas to the media. His first personal invite was to “Excuse Me, While I Kiss the Sky,” an art exhibit featuring live music and storytelling on display at the Salt Lake County Complex here on State Street. The creative works of people from seven faiths and as many countries opened to the public in the North Building with coverage by Carole Mikita, one of the co-anchors at KSL 5 Television and the station’s arts and religion reporter. Inspiration for immigrants to share their stories and not just their art comes from Dr. Leslie Whited, CEO and Diaconal Minister of LSSU. Not just for the sake of storytelling, but storytelling as a means to practice and expand upon acquiring English as a Second Language skills. At the “Excuse Me, While I Kiss the Sky” opening, Whited proudly wore a Kente-cloth stole. “Kente cloth has its origin with the Ashanti Kingdom and was adopted by people in Ghana and many other West African counties,” the Wikipedia entry says. Whited is a member of the Black Storytellers of Utah. A recent read by BSOU members was Isabel Wilkerson’s “The Warmth of Other Suns: The Epic Story of America’s Great Migration.” Whited read select passages from “The Warmth of Other Suns,” apropos to migration experiences of people anywhere in the world leaving one place for another. Jose, a skilled guitarist with El Salvadorian roots, was part of the live music set for the exhibit opening. His musical affinities include ranchero, cumbia, Huapango, bolero and waltz. Jose is sometimes accompanied by Whited on vocals and more often by harpist Carlos Eligio Garcia, forming Royal Heritage Music. Being welcomed with opened arms is not just a matter of speech. Matasa’s offer to create, teach and collaborate with her new students on a project at LSSU was receptive in a fertile environment conducive to teaching, learning and where the arts have a prominent role in ministry. On most morning visits to LSSU, you will observe Chad Shahid leading a classroom filled with refugees being taught English as a Second Language. Shahid has been a teacher for more than two decades. Matasa chose the mosaic arts as medium for her first project at LSSU, calling the artwork that now greets everyone entering the LSSU building, “The Nations Tree.” LSSU is located at 4392 South 900 East in Salt Lake City. “I’m calling the mosaic “The Nations Tree,” Matasa says. “It is connected to ‘The Tree of Life’ and ‘The Axis Mundi,’ which is the connection between heaven and earth, like the map to heaven or the ladder to God. It is for the ones, the refugees, who are represented here. ‘The Nations Tree’ is the keeper of the universe’s words, memories and archives. 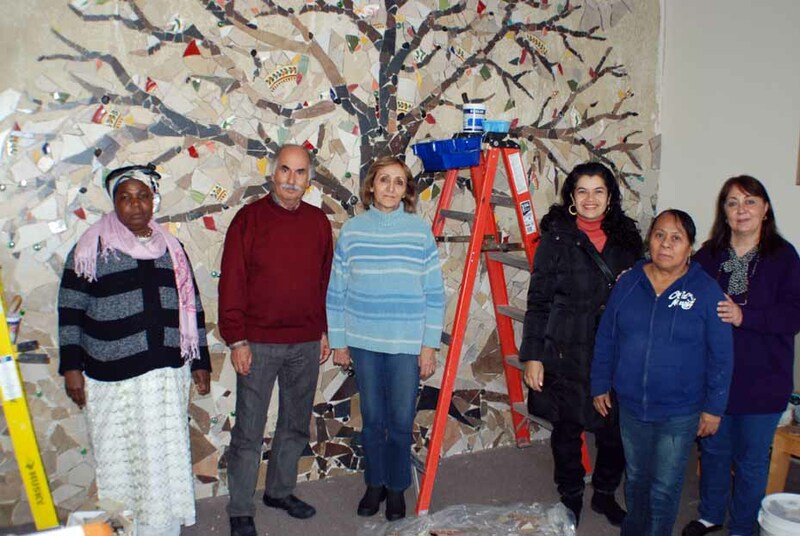 “The Nations Tree” is the 30th mosaic that Matasa has worked on throughout the world. “Mosaics you can work in two dimensions or three dimensions,” she says. “I am getting joy from this project because I can interact with people from all over the world. I am getting a lot of joy in the art itself. In the classroom, Matasa teaches students various aspects of a fine art that dates back more than five thousand years to Sumeria and Mesopotamia. “My students are learning a lot of technical stuff about mosaic arts,” she says. “They are also learning how I can apply these same techniques at home on projects in the kitchen or outside. Outside you can design whatever you want. You can make pieces for the garden. Responding to a question about the origins of the mosaic arts, the next morning Matasa emailed a PowerPoint presentation that features images of classical mosaics, including the pavement in Olynthos, the ancient Greek city. This ancient mosaic depicts the hero Bellerophon riding on Pegasus, dating back to around 415 B.C. There is also a close up of the Pella Lion Hunt Mosaic (circa 300 B.C.). It was in the ancient capital of Macedonia. Did you know that the exterior of the Dome of the Rock in Jerusalem (600-700 A.D.) is intricately adorned in mosaics, as is the Great Mosque of Damascus (715 A.D.)? Matasa’s students, for sure, have a worthy teacher and accomplished artists as a collaborator. She is fluent in several languages, including her native Romanian, Spanish acquired living two decades in Venezuela, Portuguese and English. Matasa interprets for Amanda whose English is gaining. Collaboration on “The Nations Tree” began at the end of October and was completed in March. Plates and tiles are broken with a hammer. If those pieces don’t fit, cuts are made with a special pair of pliers. Tiles and things were donated by a tile and flooring store. Tracking the artistic endeavors of Liliana Matasa can be like perusing through a well-organized friendship campaign put together under the auspices of the United Nations. Her graphic artworks have been exhibited in far-flung places throughout the globe. Matasa, born and raised in the mountainous small city of Piatra-Neamt, Romania, has been featured in 32 individual expositions in ten countries, the United States among them, while participating in 132 international and national shows of the annual, biennial or triennial variety — in a combined 24 countries. She left Romania at age 24 to study at Escuela de Artes Visuales Rafael Monasterios and then earned a Master’s of Art in Education from the Universidad Bicentenaria de Aragua. Both institutions are in Maracay City, Venezuela. After meeting and marrying a Utahn, Matasa, a divorcee, relocated to Salt Lake City about seven years ago. “Starting a new life in America, it is implying that we build a new, stronger and amazing tree,” she says. “It is grafting the most beautiful and wonderful tree from all the new starts offered from around the world. The tree symbolizes the hope that we will understand, feel and act as one and overcome our actual condition. Former Gov. Jon M. Huntsman Jr. delineated well how wars abroad — since the Vietnam War — gradually transformed the state into Utah, The Diversity Place, as if dramatically responding to poet Emma Lazarus’ “The New Colossus.” Utah is a receiving place in the American West akin to what Ellis Island meant to immigrants arriving in New York Harbor all those years ago from Europe and Africa. Phrases like “People Bridges to People” and “ordinary people doing extraordinary things in service to others” were born also here in Utah, proliferating obviously in Salt Lake City, West Valley City and Ogden, among other places less conspicuous. And nowadays it doesn’t have to be war that brings newcomers to Utah. Remember Hurricane Katrina? Post-Katrina, as they say, native New Orleanians have adopted the Beehive State as home. This doing extraordinary things in service to others, richly, is a merit that applies to Liliana Matasa, who previously did a volunteer arts project at the Wasatch Youth Center. There, she taught students the art of making collages. Nowadays Matasa is focused on creating abstract contemporary pieces. Though gallery space is difficult to come by here, Matasa has an exhibit of mixed-media collages at the Contemporary Design & Art Gallery in Salt Lake City. She also longs to exhibit in Park City, where skiers, Sundance Film Festival and summer vacationers come from all over the country, if not the world for Sundance. Recently Matasa had simultaneous exhibits in her native Romania and Holland. She also has gallery space at Saatchi Online, a website launched a few years ago by London-based Saatchi Gallery. Go to http://www.saatchionline.com/profile/90340. You may call Liliana Matasa at (801) 262-5302 or email liliana_matasa@hotmail.com. Students as collaborators work on “The Nations Tree” with Liliana Matasa, far right, at Lutheran Social Services of Utah are Wata, Akbar, Katy, Amanda and Maria.